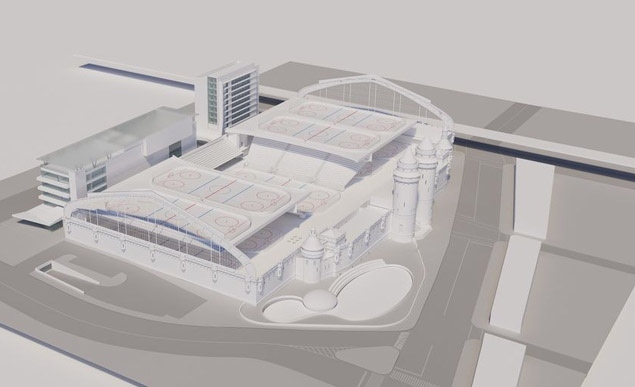 The ice sports center proposed for the Kingsbridge Armory in the Bronx would be the largest facility of its kind in the world, with nine indoor ice rinks and an outdoor rink. Proposal obtained by Daily News ahead of armory bid selection. The ice sports center proposed for the Bronx’s vacant Kingsbridge Armory would be the largest facility of its kind in the world, the Daily News has learned. The Kingsbridge National Ice Center, one of several bids solicited by the city to redevelop the fortress, would feature nine indoor rinks and could attract up to three million visitors per year, more than the Bronx Zoo, sources said. Backed by New York Rangers legend Mark Messier and Olympic figure skater Sarah Hughes, it could also boast an ice sports-themed public school on city property that would be acquired under a separate deal. The businessmen behind the proposal have lined up The Urban Assembly education franchise to run a new K-8 academy north of the armory on land currently occupied by the National Guard. The school would train students for the National Hockey League and careers in sports medicine, media and management. Wall Street executive Kevin Parker and partners want to build five rinks on the armory drill floor, including a center rink with 5,000 seats, four additional rinks on mezzanines and an outdoor rink. The complex would host hockey matches, skating competitions and ice shows, sources said. The developers want Madison Square Garden renovator Murray Beynon to design the facility, sources said. They expect to spend $250 million and vow they don’t need taxpayer funds. Their bid also calls for an afterschool ice sports program for local youth, modeled on the Ed Snider Youth Hockey Foundation in Philadelphia, with homework help provided by the New York Academy of Sciences. The developers plan to reserve 30,000 square feet along Jerome Ave. for the youth program and for community groups. Their proposal includes locker rooms below the drill floor and about 400 underground parking spots. It also includes a snack bar and ice sports retail but no additional restaurants or stores. The plan is a departure from the armory shopping mall plan shot down by the City Council in 2009 over wage concerns and objections by local business owners. The ice center developers are vowing to pay a living wage to more than 200 event managers, skate sharpeners, Zamboni drivers and other workers. Their plan also contrasts sharply with the “creative market” bid submitted by West Village developer Young Woo, who wants to make the historic structure a hub for homegrown entrepreneurs. The city could select a proposal as early as next month.